50 g of cotton is more than enough for 1 pair and depending on the size maybe 2, except if you are knitting cup size F or G in which case you may require more yarn (so keep any leftovers from previous kits). 25g of filling should be sufficient per pair but we will add filling where necessary. Any extra knockers will be filled by us before they are gifted to a survivor. Hallo Dana. Great project girl! Would like to get involved. Please forward me the cost etc. thanks. Would love to get involved, please forward me details. Thanks. Thank you for your enquiry. 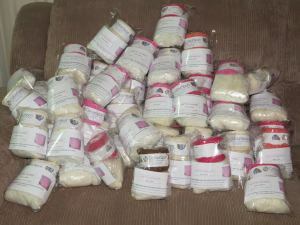 You can order them directly from the Colourspun website: http://www.colourspun.com at R50 per kit plus postage. Or via email to dana@colourspun.com. Each kit does about 3 knockers, depending on the cup size. I have some stock in Durban as well. Have a great day. You can order them directly from the Colourspun website: http://www.colourspun.com at R50 per kit plus postage. Or via email to dana@colourspun.com. have an awesome day and thanks for the support. What do you do with them once they have been knitted as I do not need it myself but would do it for charity? Yes they will be donated to those need them, either through the Pink Drive or any local Breast Cancer support groups. We are in the process of setting up some distribution points. You may also knit for a friend although we would love to hear when they have been given. It is great fun knitting knockers as they are quick and easy on Two Needles. If you have any other queries, send us an email on any of the contact emails.